As opposed to newsletters and one-off campaigns that you create and send to a whole list of people in one go, email automation is an automated email campaign is set up once and then automatically sent to a particular individual when that person meets a certain trigger. To give you an example, imagine you’re Facebook and you want to send an email to users when they signup for an account. This email will welcome them to Facebook and show them how to get started adding friends and uploading a profile picture in an attempt to get them to become a frequent user. It would be a huge waste of your time to manually create and send an email campaign to every person when he or she signs up, so instead you could set up an automated welcome email that gets sent whenever a new person joins your “Signups” list. 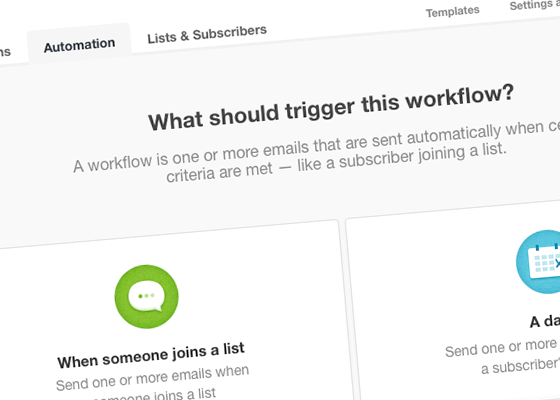 That’s the beauty of automation: you can set up the email once and then, as more people continue to meet the trigger you defined, the email will continue to be sent to them without you ever having to lift a finger. It essentially ‘automates’ your marketing for you. Because Automation works on a basic trigger and action system (i.e. when a specific trigger happens, send this specific email or set of emails) you are really only limited in what you can do by your creativity and business needs. To give you some ideas and help you get started, we’ve compiled this list of automated emails you can start sending today that will help grow your business. It is often true to say that a large percentage of visitors to your website aren’t yet ready to buy. However, these people have clearly shown interest in what you have to offer and are perfect candidates to continue communicating with to try to get them to buy later on. A great way to do this is to get them to subscribe to your email list. Subscribing to your list is a much smaller conversion action than handing over money to make a purchase, and therefore people are much more likely to do it. Once they’ve subscribed, you can then use an automated email campaign to welcome them to your list and offer a special subscriber-only offer that compels them to buy. 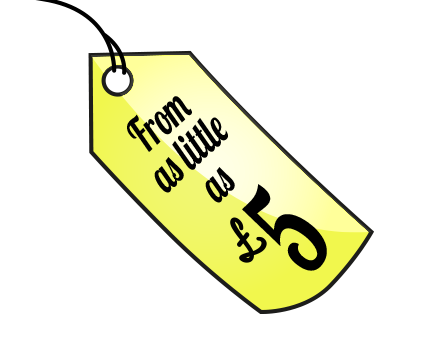 An example would be an email offering a 10% discount off their first purchase, or something additional if they book within a specific time-frame. This kind of automated welcome email can be set up in just a few minutes. You simply need to add an email subscription box to your website that adds people to a list in your chosen email marketing tool, and then set up an automated email to go out whenever someone joins that list. If your ecommerce platform supports it, you can even generate a discount code and include it in the email. Not only does this provide a great incentive for people to purchase, it allows you to track the effectiveness of the campaign and see the impact it has on sales. If you have had a customer sign up for something, but they have not started using it yet, there are a number of ways to help them to start doing so. One scenario would be that a customer signed up to an online directory or dating site, but has not yet uploaded a profile picture, or filled out key information – an email could be triggered based on this criteria and automatically sent to the customer as a reminder to do so. 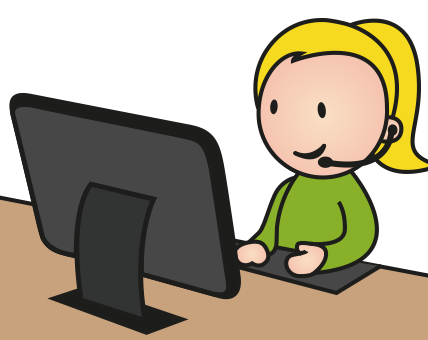 If the customer has not logged into their account for a certain amount of time, this could trigger a reminder email, asking if there are any problems or issues. Each email would be friendly and helpful, structured to encourage the customer to log in or tell you why not. The purpose of these is to get customers to use and experience the product, when they have (and they are won over), you can begin to up sell or cross sell using other techniques. After a person has signed up or purchased something, it’s really good to find out why. This is important to know in order to continually develop the right products and services as well as understand the audience’s desires and wants (and what pains them too!). 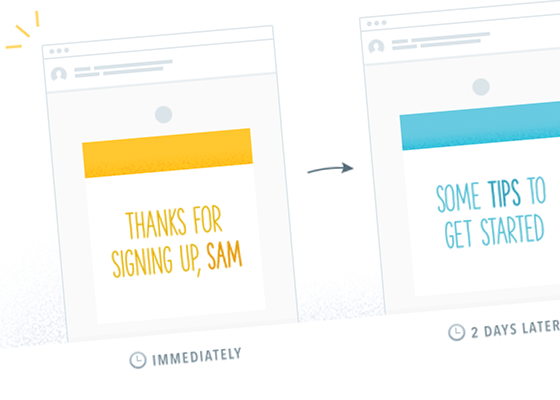 A simple email post-sign up, thanking them and posing one strong call-to-action is worth doing to find out this valuable information. To keep a step above the competition and ensure the right messages are being sent out with marketing and advertising, this automated email really is a no-brainer. If this is appropriate to your business, let’s do it! If you have products or services that have end-dates (expiration dates and renewal dates), this is a particularly useful tool. Trigger emails a month, a week or days before things are due to expire will alert the customer to the issue as well as encourage the renewal (and further engagement with your organisation). Clear and strong calls-to-action are integral to these emails. Giving your customer a nice surprise on his or her birthday is a true joy. It isn’t just restaurants, bars and retailers that can offer a birthday incentive or offer – it can be any industry sector that wishes to build a personal rapport and address the customer as a human – the messages just have to be chosen carefully. Restaurants and retailers would be sending out any offers a few days before, so that the birthday boy or girl can book a table or arrange a babysitter before they take advantage, but other industries could send it on the day with the sentiment and message appropriate to the situation. 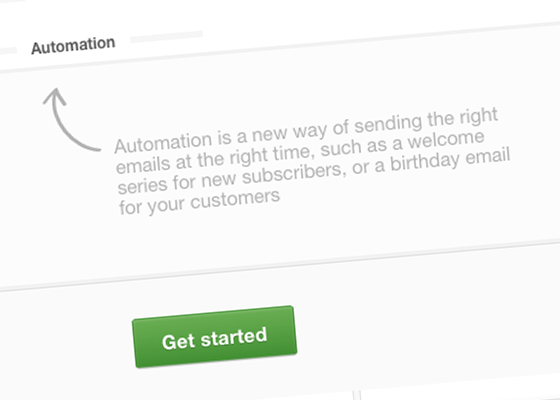 Isn’t email automation sounding good now? For those whose businesses revolve around specific time slots and appointments, this is a great way to keep your brand in the customer’s mind as well as ensuring those valuable slots are not missed. Examples would include a dentist or a doctor sending out reminder emails in advance of appointments, but they would work equally well for hairdressers, mortgage brokers, sales appointments and demonstrations – in fact anything that someone makes an appointment for. Not only is this good for appointments that have already been made – but it’s brilliant for reminding people that they need to make the appointment in the first place. An email saying that it’s time for them to book their checkup or, it’s six weeks since your last haircut – these are tried and tested ways of building customer loyalty and ensuring repeat business. When you’ve published a new blog post on your site, you want to encourage your audience to read it and fingers-crossed, have them share it on social media or forward to a friend. To kickstart that process you could set up an automated email issued to a reader list with an enticing graphic and call-to-action to read the blog post – ultimately you want to get them to the post and share it from there. You set up the email automation to be sent daily / weekly / monthly and the email automatically monitors your blog’s RSS feed and then it pulls in the content published on the blog since the last time the email was sent. Offering an email course (a number of lessons on a particular topic delivered via a series of emails) can be a highly effective way to capture subscribers and educate them on a chosen subject matter. When executed correctly, it helps to build your email list while showcasing authority and expertise that encourages people to eventually purchase from you. It’s imperative that the emails are designed properly and content easily digestible, not forgetting the all-important call-to-action. Getting started is simple: a form is added to your site or landing page to capture subscribers and then a basic sequence of emails is set up to be sent out at different intervals whenever a new person subscribes to that list. Whether it’s a physical event or meetup or a webinar or online course, getting people to attend is critical to its success. Depending on whether the event is free or paid for will often dictate what percentage of registrants actually attend the event (unfortunately at Squeezymail there’s not much anyone can do about no-shows, other than a shaming email). A series of reminder emails on the lead up to the event are vital to keeping in the forefront of the attendee’s mind, and then after the event (if they attended) they will get a thank you email or one containing the slides of the presentation. This can all be done using email automation. To talk about any element of email automation and think about how your business or organisation can use it, feel free to get in touch for a no obligation chat – we’re here to help.